Corporate yoga packages can be custom-made for you, your workers and colleagues. Working with groups of employees and managers we can bring the convenience of yoga sessions to you on-site, in offices, workrooms, factories, shops and restaurants. 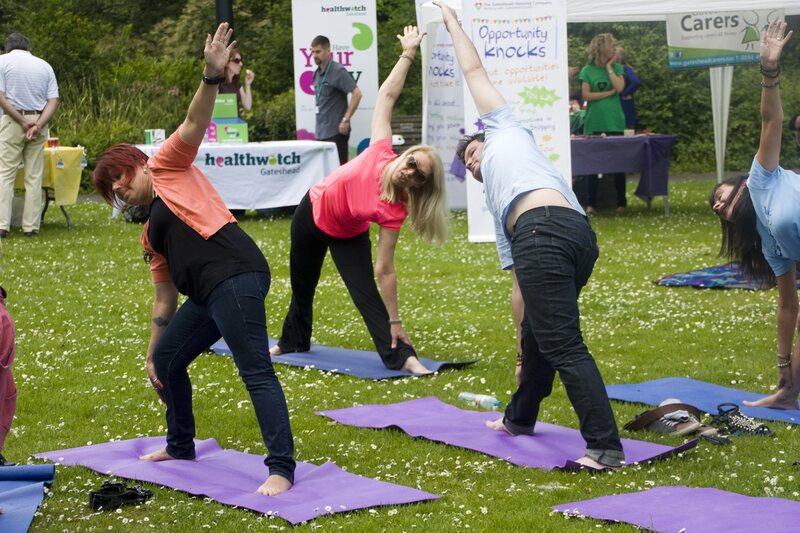 YogaWellbeing has provided corporate yoga for organisations and businesses including Gateshead Hospitals NHS Trust, Proctor & Gamble, PrismTech, Northumbria Probation Trust, Harland Accountants and many others. A weekly yoga session could improve physical and mental health of workers and managers, teach them about relaxation, boost their immune systems and their energy levels. Corporate mindfulness packages offer so many benefits to a stressed out workforce, not least a time to relax and create a little space to think and reflect. Mindfulness courses for corporate and business customers can deliver our most popular 8-week course or be custom-made to suit your time commitment and workforce needs. Community Groups can benefit from yoga classes too. YogaWellbeing works with a wide range of community organisations and charities to secure funding for health and well-being initiatives. Gateshead Carers, Gateshead Bangladeshi Association, Gateshead Muslim Society, Crossroads Carers, Gateshead Council Sports’ Development are among the groups YogaWellbeing has worked with. YogaWellbeing will work with you to tailor the programme to suit the individual requirements of your school, staff and children to achieve the desired learning outcomes. Teachers love children’s yoga too! Feedback from classroom teachers shows that they observe a visible difference in children after yoga sessions. The children appear calmer and more relaxed. Children’s ability to concentrate is often transformed quite dramatically. Relationships between staff and children and between the children themselves can also benefit. A child’s social skills and their educational attainment can be significantly improved through greater awareness and self-reflective processes promoted within their yoga practice.